We work so hard to get attention. We craft our headlines to make them irresistible. We strive to display enticing images that make a great first impression. If we’re Copyblogger readers, we think about finding that perfect balance of meaning and fascination that will pull our audience right into our content. But what do we do with attention once we get it? One of my favorite aspects of content marketing is the way we can use content to pave a comfortable path for our audience to move toward a purchase. Attention matters — because if you can’t capture it (and keep it), nothing else happens. But once you have the audience’s attention, it’s time to invite them to walk with you a little way — on what is sometimes called a content path. This is where the “clickbait” writers fail. If this piece of content — the one you’ve crafted to capture attention — isn’t worth your audience’s time, that audience isn’t likely to follow you to the next step. So yes, hook your reader with an enticing headline, a compelling idea, and a fascinating promise. Use great analogies, numbered list posts, and all the other tricks of the trade to bring people into your site. Then keep those promises and deliver the excellent content experience that person is looking for. Once you’ve captured audience attention and delivered a fantastic experience with your content, it’s time to ask your friendly reader (or listener, or viewer) to go further down the path with you. This is difficult for only one reason: You have to decide what that path will look like. You have to figure out the ideal way that a stranger becomes familiar with you, learns to trust and value you, and ends up making a purchase. Your content path — the string of experiences you create — teaches new audience members all about why your offer is special, the benefits of working with you, and the reasons they’ll want to move forward with your product or service. Don’t look for simplistic “formulas,” because each of us has a unique combination of audience, expertise, and offer. Figure out what would make sense for your people, given what you have to offer them and the content you publish. For most of us, the best way to get started is to take a guess on what that path could look like — then refine it based on observation. Build your content paths one at a time, and see how they work. You may end up adding some steps, subtracting others, and adding thoughtful automation to deliver a more personalized experience. You can also construct multiple paths for different kinds of buyers. What’s the next step closer to you? 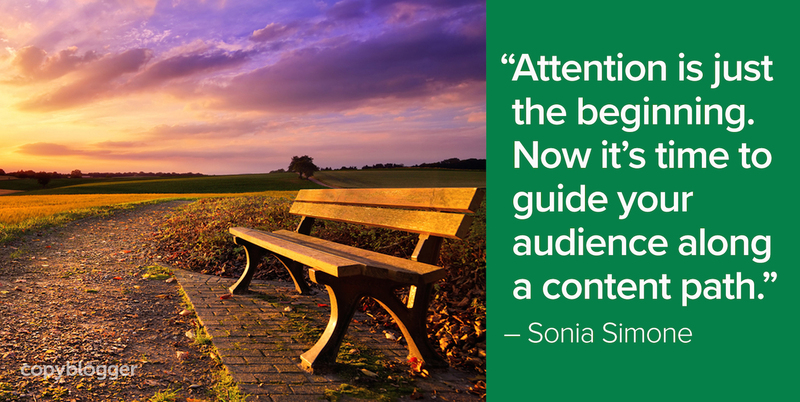 Every step you ask for should lead the audience closer to you. Paths are simply suggestions. Your audience will move backward or forward based on what they feel like doing. And that’s great. But you don’t want to ask them to move backward. So normally, you wouldn’t include a call to action on your blog post to go “Like” your Facebook business page. That’s further away from you, given that in 2018, businesses often need to pay Facebook just to get our page “fans” to see our work at all. But it could potentially make sense to move the audience to a Facebook group, for more interaction and in-depth conversation. Or to a Messenger chatbot automation, which would deliver relevant content based on their interests. Now, both of those are on a platform you don’t control. So at some point, you’ll offer something valuable that’s delivered by email. That way, when Facebook loses its mind overnight — and they always do, eventually — you still have a reliable way to connect with people. Does this step move the person closer to me? Does this step move toward a communication method I can reasonably expect to control? Can you upgrade the experience? One smart way to create a smooth next step for your audience is with a content upgrade. If your blog post teaches readers all about how to feed their brand-new naked mole rat pups, you might offer a “content upgrade” of a set of blueprints for a lovely mole rat hutch. They’ll get that by asking for additional communication from you, probably by joining your email list. Bring them to a communication platform that you have a reasonable expectation of control over. Once you’ve encouraged someone to walk further down a content path with you, you want to make sure you’re respecting that relationship. Typically, a brand-new content subscriber has a lot of interest and enthusiasm for your topic. They may be interested in getting lots of information. What they probably don’t want is an endless stream of pitches, or a bunch of “spray and pray” content that’s not relevant to them. That’s where smart automation comes in. It lets you give your new subscriber as much good information as they desire to feed their habit. It also lets you deliver that content intelligently, respecting their interest level and preferences. So, once you’ve captured attention, delivered that excellent content experience, and convinced some folks to walk down a content path with you … it’s time to find more folks. That’s the time to think about expanding your universe and ask who else might have this kind of audience member. Could you guest post on another site in your topic? Give a podcast interview? Can you apply some strategic social media advertising to get more eyes on your content? And, thinking long-term, can you craft a search engine strategy that will put your content in front of the kinds of people who are looking for solutions you provide? While it’s always a great idea to nurture relationships and strengthen your network, you typically don’t want to start trying to build traffic from other people until you have something smart to do with the traffic you have now. That’s what the content path excels at. Do you have a “content path” for your marketing? Is it simple or complex? Are there any steps you’ve been thinking about adding to the mix? Sonia we are finding that getting comments on blogs is harder, but a quick response, like tweeting out a blog easier. This is a good article for rethinking strategy and getting out of the weeds we can all get into with tips, tricks, and more dumb ideas that don’t go anywhere!